"How to Jumpstart Your Health and Look Crazy Good with Detox Juice Recipes (Discover every secret I've learned from years of juice cleansing)"
Do you want to cleanse your body, help a health issue or lose some weight? It's easier then you think to make juices to get a new rockin' body, and live a longer, healthier life. Feel fatigued and your body is in need of a jumpstart? 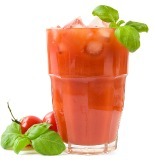 Are you starting a juice fast and need some good detox juice recipes? Do you want to lose weight or improve your health? Are you craving more energy and a rosy, clear complexion? ...Because if you answered yes to any of these questions, you need to have this! No matter where you live and how you live on this planet anymore, pollution and toxins are all around us and it’s affecting our bodies in a big way. Exposure to cleaning supplies, paints, etc. These get stuck and pass through our bodies causing damage. You could have gunk lining your intestines, or toxic chemicals floating in your blood. Toxins build up in our system and interfere with our body’s proper functioning. Toxins hide out in fat cells and need to be removed. It hinders weight loss and healing. It effects our looks by making our complexions dull, our nails and hair lackluster, just to name a few. A great way to get a new body is through juicing, and with this book you’ll have the tools to jumpstart your health by making the right detox juice recipes. Because juicing extracts fiber, the nutrients are assimilated much easier and quicker than if you were to eat a pound of produce. And because juice is mostly water, the nutrients are delivered straight to our cells and tissues to begin cleansing. There are amazing characteristics to fruits and vegetables, and all cleanse in different ways. Were you aware that beets are a great liver cleaner? It’s important to know, for yourself, which juices to make when cleansing. These plans combine the powerful cleansing juices from the Detoxifying Juices book and merges it into a program to help you if you want something structured. And if you're a free spirit like me, these will help you as an example for good ideas and extra recipes for cleansing. 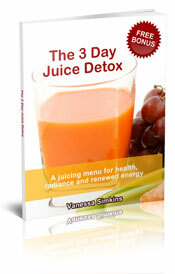 "I loved the simple detox juice combinations in this book. I did a juice cleanse before but had no clue on which juices were better. Glad I have this. I use some of these recipes everyday and I love the way I look now." ...and that's just a sample. I’ve spent years studying juices. I know which juices work to detoxify and nourish. These recipes come from my own personal collection that have helped me to cleanse my body to heal from problems (and have kept me looking younger then other people my age). You can try to develop recipes on your own, or you can just get them now, in a matter of moments. You’ll be juicing in no time! "These are great recipes! They are truly yummy. I had the hardest time finding a good detox juice recipes until I found this. I know this is TMI, but these juices helped get my bowels back to normal"
"This book is a really good price for what you get. My complexion looks great and I have a flatter belly! Thank you! Your health is at stake and you need to detoxify your body so that it can function at an optimal level. 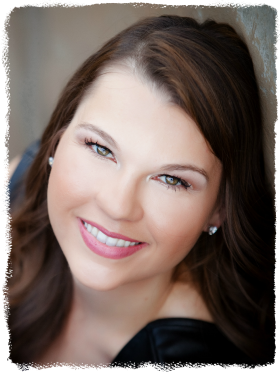 This book will help you get back your glow, regain your energy and feel great. You can lose weight and look fantastic with the power packed good nutrition that comes with drinking detoxifying juices. Simply click "add to cart" and you will be taken to the order page which will then route you to the Secure Payment Page. You can pay with any credit card or paypal. After you make your online payment in a fully-encrypted high-security environment you will be taken directly to the download page. Here you'll be given detailed instructions on how to quickly and easily download the detox juice recipe collection straight onto your computer's hard drive. You'll also get an email with the link to download it, if necessary. In a matter of 5 minutes from now you can be using this book to help you make your own juices to improve your health and looks. It really is that easy! You won’t be disappointed. "I just went through my first 15 day juice fast and used the detox juice recipes. They were a great help to me. I know that all juicing is cleansing, but wanted to have the best possible combinations. Thank you for your help." 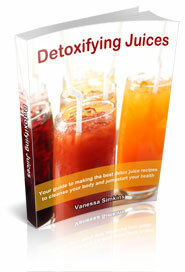 Do you have a question or comment about the Detoxifying Juices book? 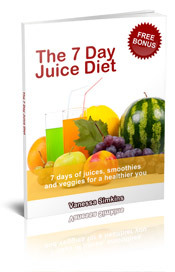 "This was the most affordable recipe book I could find for cleansing juices. Thanks! (I'm on a tight budget)." "We loved the easy recipes you provided in your book! My husband and I juice fasted for the first time and these came in handy. I felt better knowing I was using recipes targeted towards cleansing then just any recipe. Thanks so much." "Just wanted to thank you for making this book. These recipes have become a staple in my kitchen." "I used these cleansing juices with the weekend weight loss plan. I detoxed by mixing juices and smoothies for a few days over a long holiday weekend. I lost 4 pounds and I’m thilled." "I am new to juicing and just got my juicer last week. Thank you for your site, it has helped me. I bought your book because I wanted to detox my body with a cleanse and knew that these recipes would help. I found them easy for a newbie. The recipes taste good even though it doesn’t seem like they will. "-Jorge from Salt Lake City, Utah"When I first saw this book I knew I HAD to have it. I’m always at a loss for recipes when I’m juicing. I just pull the recipes up on my phone and use them daily." "My hubby and I saw the movie “Fat, Sick & Nearly Dead. We were convinced that we had to go through a juice fast to start fresh in the New Year. I am glad to have found these because I didn’t know where to start. Also happy to find the simple detox plan in the book that includes food so that we can juice and eat if we want to. This time we are going to do a 7 day juice fast, but next time maybe we’ll do your detox plan." "I love your juice recipes. I'm your biggest fan!" Do you have a comment about this book? (Don't worry, I will only list it here if you want me too).